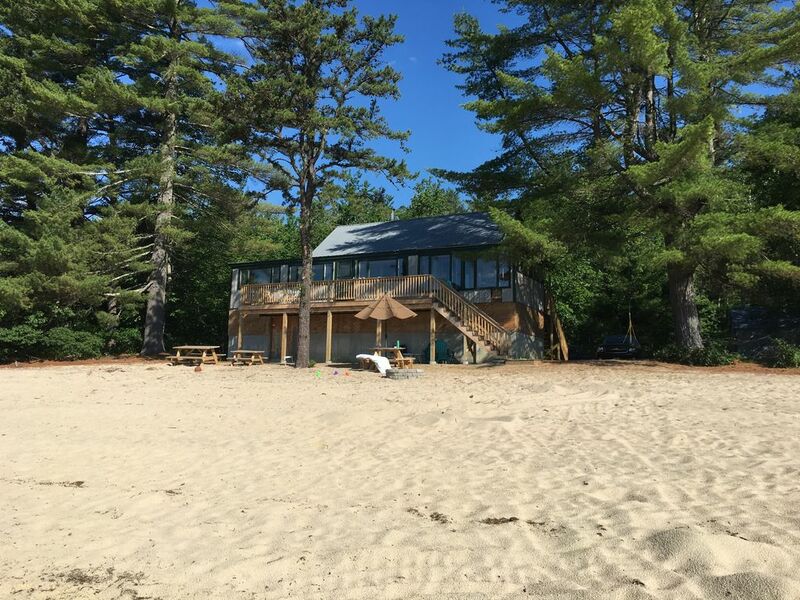 Amazing beachfront, rustic, budget friendly camp located on Lovewell Pond in Fryeburg, Maine. 15 - 20 minutes from North Conway, NH and outlet shopping! A private dock, swimming, fishing, kayaking and paddle boarding all in your backyard. Kayaks and paddle board provided for your use. Property has four bedrooms, two living room areas, DVD, and wifi. A/C in three of the bedrooms. Washer, dryer and dishwasher as well. And of course there is a fire pit for s'mores! This is a pet friendly, family friendly, smoke free house. If you are looking for luxury, this is not for you. If you are looking for an amazing location and a relaxing vacation on the water with your family, this is for you :). 1 small bathroom with shower. All necessary cooking equipment provided. Our goal was to have a relaxing, lazy few days with our dog. Mission accomplished. The beauty of this place is the beach, the views, the loons, and we even saw some eagles. We spent most days having coffee by the pond, floating and kayaking, sitting in the shade, eating on the large deck and then sitting by the fire. Our dog loves to fish so she spent every day walking back and forth looking for fish. It really was perfect. The cabin itself is a little weathered and dingy. If you are interested in a weekend "glamping," this cabin is a great choice. The kitchen is well stocked (pots, pans, and kitchen utensils). I recommend you bring extra paper towels, napkins and toilet paper The bathroom really is small but it worked. My biggest complaint was the cleanliness. The beds weren't prepared (you bring your own sheets) and the first thing I did was wash the mattress pads - they were very soiled. Cabins come with spiders, and this place is bound to track in sand, and I wish they did a better job vacuuming. Also, the garbage hadn't been picked up in a while so that was gross. Other than that, it was a great getaway which is what the doctor ordered. A cozy camp to unwind and hang out on the huge beach, cool off in the pond, kayak, make s’mores by the fire pit, and unplug from the rat race (even though there is strong WiFi if you need it.) It was very muggy during our week so we were grateful for the air conditioned bedrooms. Our toddler and dog had a blast! Had some minor issues with certain plugs not working and most of the lamps in the house were missing light bulbs. We learned to live with beach sand tracked everywhere in the house (did our best to sweep daily). Also, if you can’t stand bugs, then a camp in the Maine woods isn’t for you. (Mostly carpenter ants and gnats). Was an excellent week for our family. We explored Fryeburg (not much happening in August), checked out the local farmers market, rode inner tubes down the Saco, and spent an afternoon shopping in nearby North Conway. All in all, it was exactly the week we were hoping for! We had a great time, the beach was perfect and the house fit having 2 families. The only downside was there were a lot of flies/mosquitos when we got there which isn't the fault of the house, we bought a few traps and it definitely helped. The giant float was a hit with the kids too. Great time! This is a wonderful cottage with lots of privacy. It was rustic but well equipped and very clean. We really liked the layout because there were several rooms where you could hang out in smaller groups. Lots of different eating areas too. The single bathroom was a challenge for 6 adults, but we made it work. We stayed during a heat wave and there were fans and air conditioners to help keep us cool to allow us to sleep well. Restaurants in Fryeburg were really close by and pretty good - we ate pizza, Chinese and American. A great cottage to chill and enjoy your family and friends. Our two dogs loved it too! This camp offers plenty of room for a large family. The AC was a bonus. The furniture/ beds are comfortable. The beach is amazing! There is lots of room to play. The water was warm and shallow for little ones. The views are spectacular! You do need to bring your own water to drink. There are plenty of conveniences close by. We really enjoyed the kayaks! If you want to relax in a quiet location, but still have a campy feel, this is the place for you.